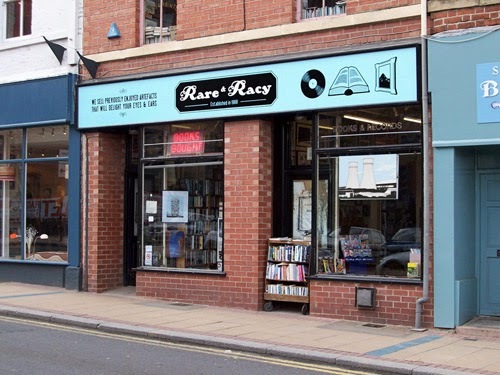 Rare & Racy is the ultimate book shop. When I found about its existence back in 2006, I was flabbergasted that such a shop existed in Sheffield. It is adorned with photographs of jazz greats, sells all kinds of literature, social study books, history books, mint viynls etc. etc. It is a cornucopia of delights. I wandered through there when I was a dreamy teenager and still a frequent customer to this day. I can spend hours there. The architecture of the place is homely. They play strange ambient records, which creates an eerie ambiance. When I first stumbled across it, I was thrilled to find that they stocked John Zorn/Tzadik CDs as no other place in Sheffield did. Even as my tastes have broadened, I still always find something to my liking there. At first the people who ran the place were somewhat aloof and grumpy. Now they welcome me with smiles! It opened in 1969 - before the sign was a little more on the psychedelic side - and it always reeks of weed. Sadly, it is closing down soon. The property is been bought and they can't afford to relocate. In an age when everyone shops online through the tax-dodger monolith Amazon, when the written word is becoming digitised and when corporate business outsell local outlets, it makes no sense for this treasure trove to continue to exist. It is a crying shame. I will always remember this place and the innumerable pleasures it brought to me. As my book and viynl collections attest, I am indebted to it.